This week I played with Temari Balls. I belong to a couple groups online and one is doing a beginning study. 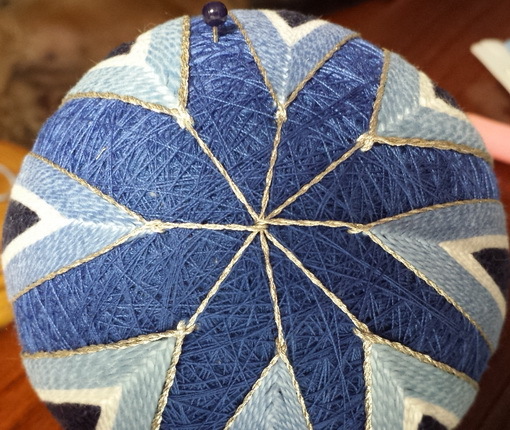 While I have been doing Temari Balls for a long time, I do not consider myself anything but a beginner. I think in order to advance you should work at the art regularly and I am sporadic at best. But I like to keep my beginning skills up and so every now and then I join in rather than just lurk all the time. If you would like to explore the two sites I frequent most, here they are: they just recently changed web hosts and I think you have to ask permission to join but that should not be a problem. This study (Beginning Basics) appealed to me because it was the perfect opportunity to explore some concepts that I had been tossing around in my head while also honing my beginning skills and practicing stitching a spindle. 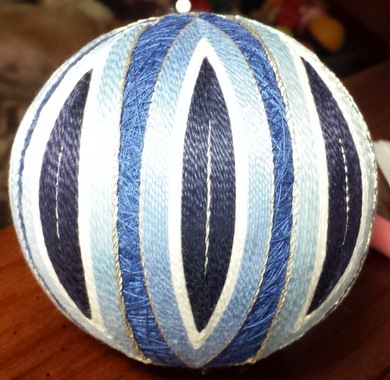 In my Temari Ball mind I have wanted to play with DMC #3 and #5 perle cotton to see the differences in making a ball. This seemed like the perfect opportunity to explore this concept. I learned that two rounds of stitching with #5 perle is about equivalent to 1 round with #3 perle. It is kind of an eyeball adjustment and a judgement call but at least I have an idea now. In the past some of my spindles seem to pop out of place and now I know why. I was not allowing enough space between the stitches. I have decided that a good rule of thumb for stitching spindles is that there should be at least the diameter of the thread between stitches. 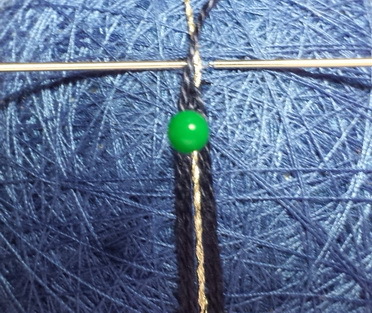 And if you lay the thread where it should be placed you can see where to take the next stitch. 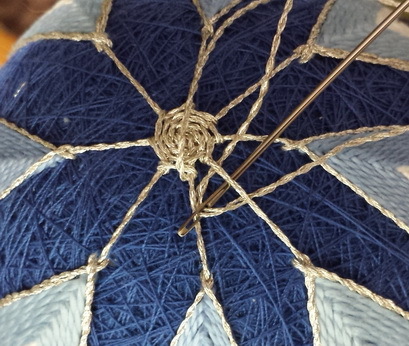 Following these personal observations, my Temari spindles turned out very well. Another thing I gleaned from this study is that if you are using more than two threads of the same color from one source, make sure they are the same or at least compatible. I used #3 and #5 perle in three colors: the white and dark blue were the same but the light blue was two different colors (even though they were the same number). When placed next to each other under a bright light, one had a blue-green cast while the other was a true blue tint. 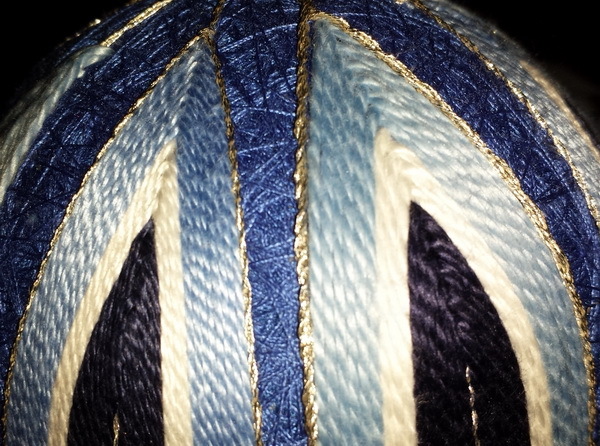 I also experimented with stitches at the pole points. This one I used a Smooth Spider Web stitch. 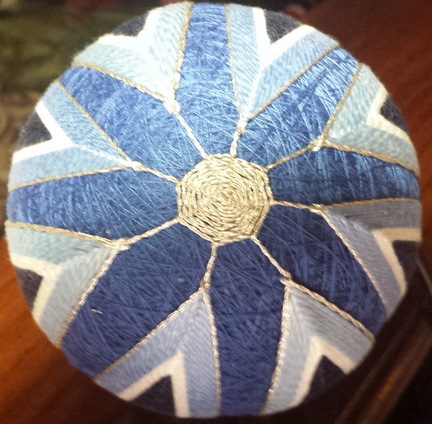 I also tried using a double silver thread and twisting it in the needle before stitching. Both of these experiments worked fairly well. 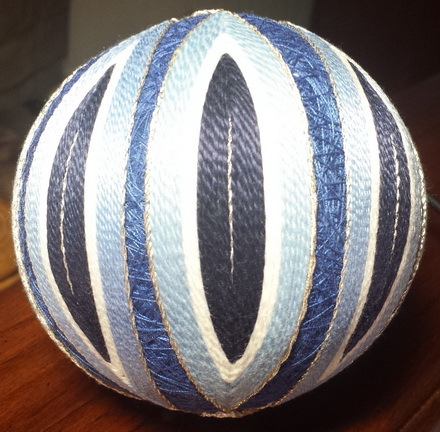 This was a fun experiment and I considered it a great learning experience, so I am going to try and continue following along and practicing…never know I might consider myself an intermediate Temari Ball stitcher when I get. I am going to get back to needlepoint and I have been stitching. I’ve been stitching on a secret project but I did take pictures and so when it is completed and given as a gift I will post all about it. And as a matter of fact going to do another one as an experiment. More later. Would also like to get back to finishing needlepoint as it is mounting up. And I haven’t told you everything I did last summer and this summer is already about half over. I made a list of things to write about and I don’t think I’ve covered more than a couple….see how I get distracted. Okay off to finish another non needlepoint project….but next week I will share needlepoint.